Youth 4 Wheelers ... Don't Buy Until You Read This Report. We know most youth 4 wheelers have one thing in common. Their size. Many are styled to look like miniature versions of their full size counterparts. But that's where the similarity ends for a lot of ATVs for kids. So what different features do they have and which are most desirable? Those are questions this article intends to answer. Top Features - Youth 4 Wheelers. Engine - 2 stroke or 4 stroke? That's the question. Youth 4 wheelers will have one or the other. What about electric you say? Good question, but electric ATVs haven't yet caught up to their internal combustion cousins when it comes to grown up features. Big fun with small youth ATVs. So which engine is the best? Depends on what you're doing with it. For overall ease of use, I tend to lean toward the 4 stroke. Just think lawn mower. If you think your tot needs to go faster, and you don't mind some extra maintenance, go for the 2 stroke. Starting - Pull, kick, and electric. That's what you have to choose from. Many ATVs come with electric starters plus at least one form of manual starter, either pull or kick. Electric starters have made life a lot easier for those of us that remember what it's like to start ATVs with a rope pull starter. Those can give you a great workout, but that's probably not high on your priority list when your kid is ready to ride. Brakes - Now that you're going, the next most important thing is stopping. On youth four wheelers this gets a little more complicated. There are 3 main components you have to think about. 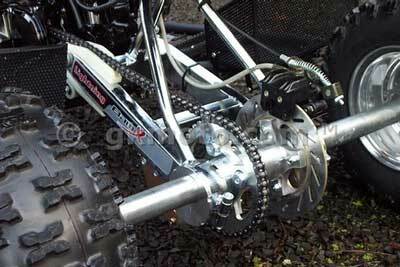 Disc brakes on youth 4 wheelers. Type of brake - disc or drum. Disc brakes have the edge in performance. Drum brakes cost less. If your MiniMe just rides around in the yard no faster than you walk, drums are OK. If he just saw Speed Racer, better go with the discs. 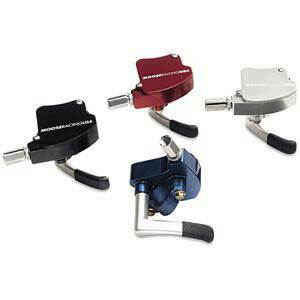 Type of control - hand lever or foot pedal. Tiny little hands may have a problem with the hand lever. But if your kid is a little bigger and/or used to riding a bike with hand levers, they'll be right at home. Some models have a foot pedal for the rear brake. If you think you'll be moving up to a bigger model 4 wheeler in the future, it's not a bad idea to start with one of these so junior will be used to it when the time comes. Actuation- cable or hydraulic. To save a long techie sounding discussion, I'm just gonna say it. Hydraulic is the best. Easier to use, more consistent, less maintenance, you get the picture. Throttle control - Thumb or twist. I like twist throttles because I'm an old dirt bike rider. But I do seem to remember a few unfortunate incidents when I was learning to ride that involved improper application of said twist throttle. Thumb throttles are just safer for beginning riders. Trust me. Also make sure there is a throttle stop screw that will limit the amount of movement of the thumb control. This gives you a way to limit the speed while the kid gets a feel for their new ride. Weight - Relax, it's not about you. It's about the rider's weight compared to the ATVs weight. For youth 4 wheelers, most industry experts (whoever they are) say that a 3 to 1 ratio is ideal. But let's custom tailor that to your kid and say a good rule of thumb is whether or not they can pick up one end of the four wheeler. If they can do that, you're on pretty safe ground so to speak. So basically a girly girl needs a lighter kids 4 wheeler, and an aspiring body builder could go with a heavier model. Width - More specifically, track width (the width between the wheels). The wider apart the wheels, the more resistance to tipping over. That's a very good thing. On youth 4 wheelers, the wider the better. Mini ATVs are so ... well, mini to start with, it would be hard to get one too wide. Wider track widths are more stable. 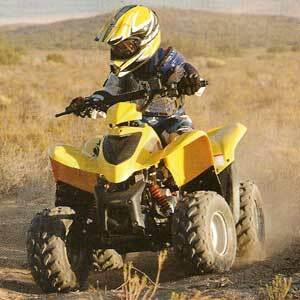 Safety - Last and certainly not least is youth atv safety. 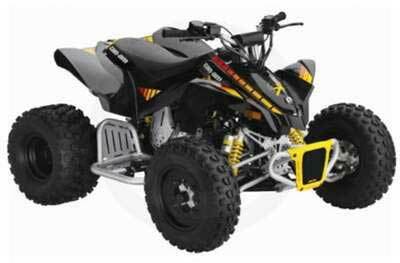 Before you buy the kid a mini atv be sure to check out our tips. Click here for youth atv safety tips. When it comes to youth 4 wheelers, if you'll stick pretty close to these features, you should be right in the "zone". And that will add up to big fun for you and the little one.